Before travelling to the small Chechen village of Koshkeldy for the funeral of Natalya Estemirova, her friends, colleagues, and people who simply knew and loved her gathered by the monument to deceased journalists near the Grozny office of Memorial. Women in mourning kerchiefs threw themselves on one another sobbing. Men stood around in small groups, talking in low voices. Someone held up a poster. Written on a sheet of blotting paper were the words: “Who will be next?” People already crushed by Natasha’s murder knew that she would not be last. And yet it had seemed self-evident that after her death there would be a pause, a breathing-space. At least for the next few months, no one would be touched... that would be impossible in the wake of the scandal that would emerge now that the abduction and murder of best-known human rights defender in Chechnya was screaming from all the newspapers, and countless foreign politicians and international organizations were making statements about it. No one in that crowd supposed that less than a month later the names of the people who were “next” would be common knowledge, and that there would have to be another funeral – that of Zarema Sadulayeva and Alik Dzhabrailov from the charity Let’s Save a Generation. Zarema and Alik were next. 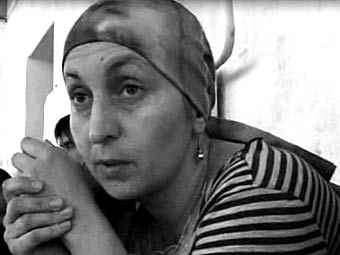 Their bodies were found in Chernorechye, on the outskirts of Grozny, at around 4 o'clock in the morning. A day earlier, after noon, five men – two in plain clothes and three in black uniforms, carrying assault rifles – had taken the two charity workers from their office. The men presented no identification – they just said they were from the “structures”, that they wanted to talk to Sadulayeva and Dzhabrailov, but that it would not take long, everything would be fine. The employees at the charity office were frightened, but the men from the “structures” behaved politely, and did not threaten anyone with their weapons. Soon after Zarema and Alik were taken away, two of the men returned – they said they wanted Alik’s mobile phone and car. They repeated that the matter would be quickly resolved, and they even allegedly left their phone number, saying call us if there are any problems. Another couple of hours went by, but Zarema and Alik did not return. Their colleagues began to call the number they had been given – once, twice, a third time, on and on... But the number always turned out to be outside the network. And then finally there was no point in trying to call any more, and no time to do so. The collection of dead bodies and the organizing of a funeral is a troublesome business. Unlike Natasha Estemirova, who worked on the cases that were the most “sensitive” for the republic’s authorities – kidnappings, murders, torture and other crimes committed by the Chechen law enforcement agencies, Zarema Sadulayeva was occupied with matters of what on the face of it look like concerns of an entirely “vegetarian” kind. Let’s Save a Generation took no part in politics or human rights cases. It was involved exclusively in the rehabilitation of the disabled, primarily children and adolescents: it bought prosthetic devices, provided medical and psychological aid and sent patients for treatment. It also gave instruction in things like how to minimize the risk of injuries from landmines – basic matters that in no way affected the authorities. But Zarema had taken over as head of Let’s Save a Generation after the death of the previous director, Murad Muradov, who was abducted and murdered during a mop-up operation in Grozny in 2005. At the time, the law enforcement agencies said that Muradov was a militant, and insisted that the charity was helping the armed resistance with money, food and medicine. The staff managed to hold their own. They were left in peace. But today, when the authorities in Chechnya continuously talk of the need to destroy the insurgents and their accomplices, when brutal harassment is exercised against the relatives of militants and all those against whom there is the slightest suspicion of supporting the armed resistance, or of sympathizing with it, that old story was very probably remembered. In addition, Alik Dzhabrailov, who married Zarema Sadulayeva less than a year ago and was now also working in for the charity, had spent four years behind bars for his involvement in the activity of illegal armed groups. It is possible that the case against him was falsified – there are numerous instances of such trumped-up charges. But he served his time, was released and in fact that was not the point. The point was that to the so-called “structures” he was known as a former insurgent, and the charity as an organization that had once been accused of links with the underground. And even though Let’s Save a Generation did not engage in sensitive matters and did not criticize or directly confront the regime, it was still marked out as an organization that was independent of the government and did not sing its praises. And this meant that it had no insurance, no protection. Many questions still remain unanswered – questions that should now be addressed to the prosecutor’s office. One thing is obvious: independent activity by non-governmental organizations is not permitted in today’s Chechnya. It can also be fatal. And in the case of the murders of Sadulayeva and Dzhabrailov, as in that of Estemirova, there are serious grounds for suspecting “the hand of the state”. Is it to go on like this until no one is left at all?